Practicing self-care is the cornerstone of living a healthy, well-balanced life. Intentionally making time for yourself, even if it is just a few moments a day, will help you be the best version of yourself possible. Radiance Day Spa provides a wide variety of services that are designed to complement your self-care routine, and we would be honored to help you pursue a higher level of well-being. Check out a few of our Sioux Falls massage services that are sure to leave you feeling relaxed, rejuvenated, and revitalized, then call 605-385-0065 to book your appointment today! If you have tight muscles in your neck, back, and shoulders, then you want a massage that is specifically designed to gently melt away muscle tension and promote deep relaxation. Our Soothing Hot Stone Massage is guaranteed to do just that. 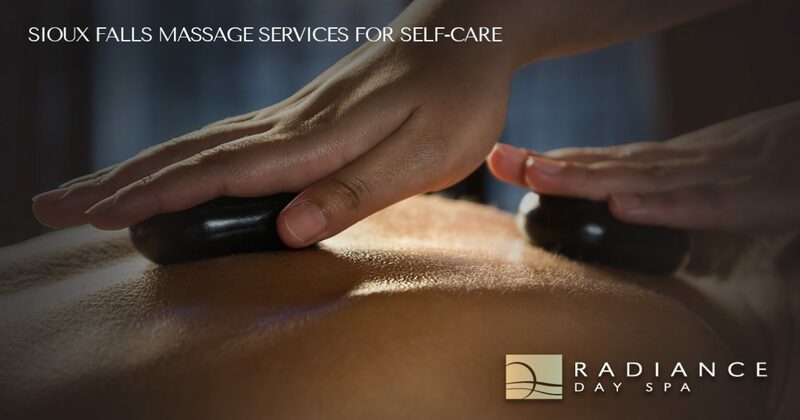 During your session, your massage therapist will use radiant river rocks and long, fluid massage strokes to provide relief for your most troublesome spots. If you have never experienced the relaxing experience of a hot stone massage, prepare to be amazed. Tight muscles are not only uncomfortable, but they also have a tendency to store a lot of toxins, and too many toxins in your system can leave you feeling worn down. Our Deep Tissue Massage is an intensified version of a traditional Swedish massage. This type of massage not only promotes circulation, tranquility, and a heightened sense of well-being, but is also ideal for releasing muscle tension and detoxifying your body. With properly communicated preferences related to pressure, this massage can transport you to another world. Being pregnant is no easy feat. After all, your body is concentrating its efforts on forming a new life. Providing it with a little TLC is a wonderful means of self-care, and it is the perfect way to pamper yourself before your little one makes their appearance into the world. Our Prenatal Massage is sure to melt away the aches and pains that are commonly associated with pregnancy, and your massage therapist will take care to ensure that you and your baby are comfortably supported with a pregnancy pillow or a specially designed massage table. While some may view self-care as a solitary activity, others find that they are able to recharge themselves better while they are in the company of their significant other. If that sounds familiar, our Couples Massage provides a tranquil experience for you and your partner. Soft music and candlelight set the perfect setting for joint relaxation, allowing you to relax and unwind as you both enjoy a 50-minute Swedish massage. Refreshments are also included in this massage service so as to further enhance your time together. Book Your Sioux Falls Massage Services Today! Whether you are you looking to enhance your current self-care routine, or you are just starting your self-care journey, Radiance Day Spa is here to help. Our certified massage therapists take great care to listen to your needs in order to suggest a massage technique that will relax, detoxify, and balance your body. We are also happy to review the benefits of our other spa services. From flotation therapy and body therapy to high-quality facials, you’ll find everything you need to restore calmness and tranquility to your life. Schedule your Sioux Falls massage services now!